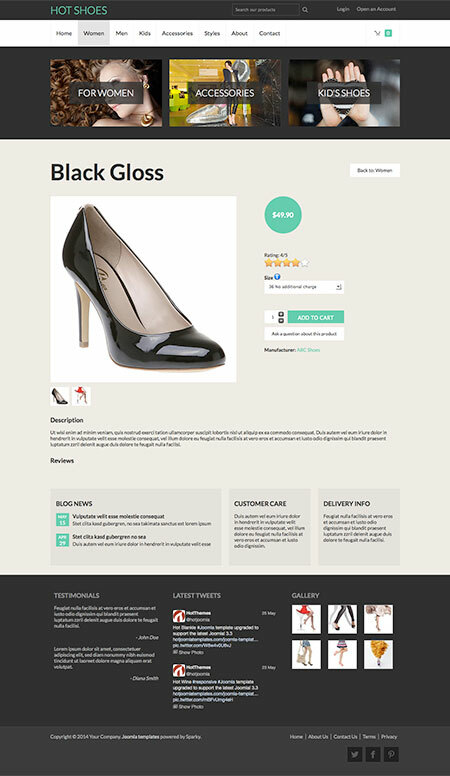 The Shoes template is responsive Joomla template powered by VirtueMart e-commerce component. As its name says, it's primarily developed for companies that are selling shoes and accessories online. However, the clean design of the Shoes template allows you to use it for any other kind of online store. Big responsive carousel (based on our Hot Full Carousel module) on the home page shows the most attractive images altogether with some details about the collections or the products, including descriptions, price and social buttons. After the carousel, there are 3 banners with nice CSS3 based roll-over effects that can be used as entrance to the product categories. The main content area of the Shoes template is, of course, reserved for the VirtueMart's layouts (featured products, categories, product details, shopping cart...). In this area, there are also some module boxes that can be used for most important information about your store (news, delivery info, customer care...). Finally, the big footer area on our demo is used for testimonials, latest tweets (you need to setup your own Twitter widget) and small products gallery based on Hot Lightbox module. Responsive template, based on a clean CSS/CSS3 code, and powered by Sparky Joomla template framework. Full support for VirtueMart e-commerce component. 5 pre-defined color styles. All colors are easily customizable from the Sparky options (infinite color options). Hot Full Carousel, Hot Lightbox and Hot Maps modules are included with Hot Shoes template. All commercial modules included in this template are free for you, if you buy template (you save $15 per module). All extensions are styled and configured for using with this template. HotStart (SQL dump) available with both single purchase or membership plan. It copies template with all extensions and demo pages easily. 14 module positions are used in our demo. Unlimited number of module positions can be added easily within Layout Editor of Sparky Framework, if needed. Top menu with drop-down sub-levels. Tested with IE8+, Firefox, Chrome, Safari, Opera. Tested on iOS and Android mobile devices. 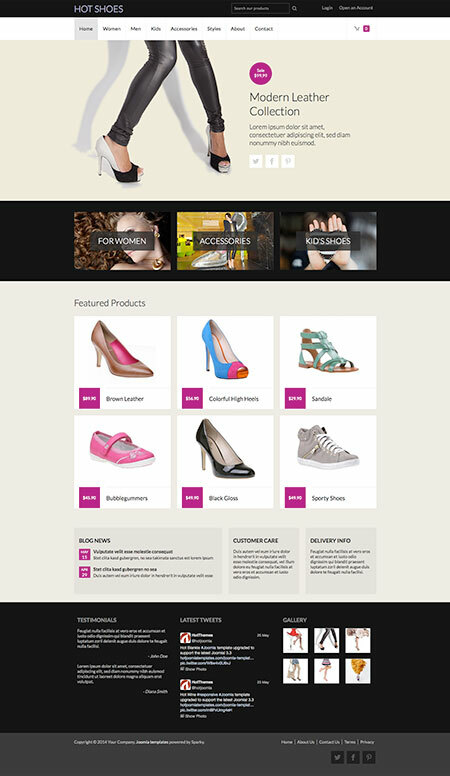 We hope this Joomla/VirtueMart Shoes template will help you to make a successful online store for the shoes and accessories (or any other kind of) products.